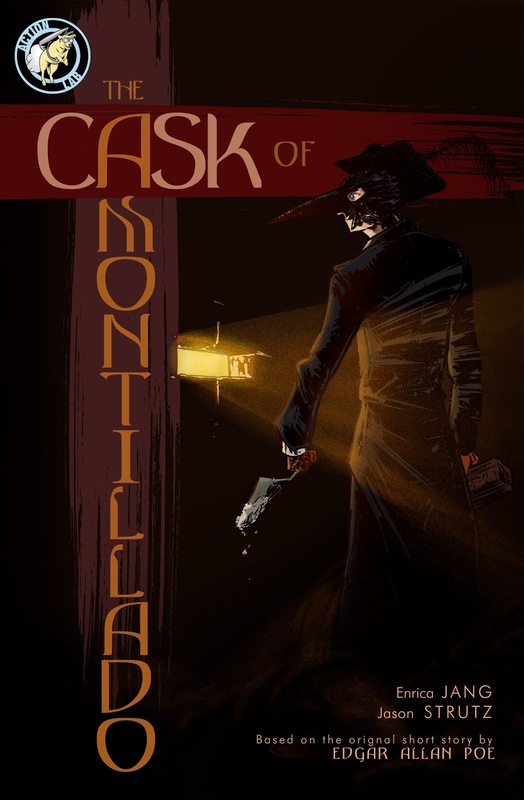 The Fellowship was fortunate enough to obtain a copy of THE CASK OF AMONTILLADO from Action Lab Comics and Red Stylo Media. Enrica Jang adapts the story by Edgar Allan Poe, and Jason Strutz draws and colors. Fortunato is lucky indeed. In the middle of the Carnival celebration, his good friend Montresor has found him and is claiming to have procured a pipe of the finest Amontillado. Now he’s offering to show him and allow him to taste the exquisite wine. All he must do is follow Montresor deep into the cellars under Venice, braving his allergies and the damp air. Adapting classic stories is a tricky path, and this one is navigated very well indeed. Many of the best adaptations rely strongly on the art to take the story to a different level. And the art here is darkly subtle and carefully revealing. The cellars feel ominous and dreadful, and Fortunato’s horror when he realizes what’s happening is gripping. Both writer and artist are clearly in sync in this beautiful adaptation of one of my favorite Poe tales. If you know anyone who hasn’t read Poe, this book would be an excellent way to introduce them to the dark wonder of his short fiction. A good reason to pick up a spare copy, I’d say. THE CASK OF AMONTILLADO is available now at your FLCS or at actionlabcomics.com or redstylo.com.